In the end, a race that might have slightly helped ease the pain of the narrow loss of Stacey Abrams in her race for Georgia governor last month fell short, when Democrat John Barrow lost his bid to become the next secretary of state, 52-48, in a runoff Tuesday night. 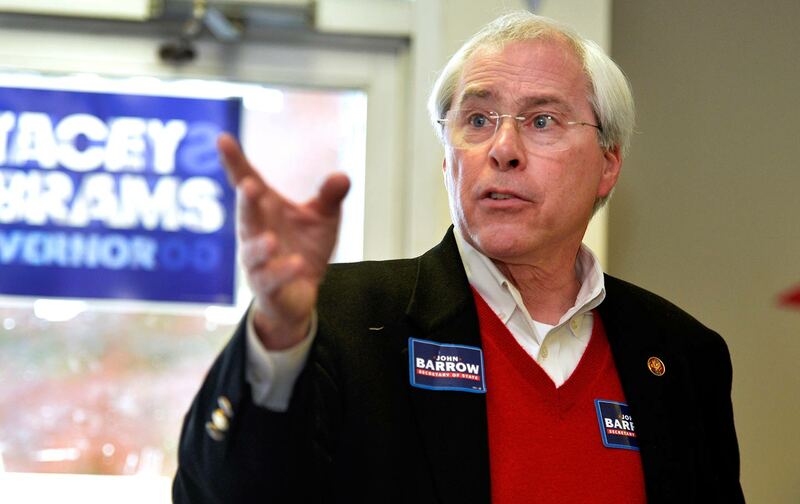 Barrow sought to succeed Republican Brian Kemp, who defeated Abrams last month, and to undo the systems of voter suppression that allowed Kemp to choose the voters who made him governor, rather than the other way around. Although Abrams tried to elevate Barrow’s race as part of her effort to use her loss to focus attention on Georgia’s unfair voting procedures, Barrow lacked the organization he needed to amplify her message—and maybe didn’t even have the message he needed. The white, former Blue Dog congressman from eastern Georgia voted against the Affordable Care Act and did not oppose the state’s voter-ID law, as Abrams did. He seemed to count on his status as Georgia’s last white Democrat in Congress to pull over white voters, joking in one ad, “Yeah, I’m a Democrat—but I won’t bite ya!” He did not evangelize against Kemp’s voter-suppression policies as vociferously Abrams did. But he was committed to reforming Georgia’s much-criticized and insecure electronic-voting apparatus and moving to a paper system, and undoing many of Kemp’s voter-discouraging policies. Republican Brad Raffensperger promised to continue Kemp’s legacy. President Donald Trump endorsed Raffensperger, tweeting that he would be “tough on Crime and Borders,” though the secretary of state plays no role on either issue. Where Abrams got almost 2 million votes in her narrow November loss, Barrow got just under 700,000 Tuesday night, a little over one-third of her total. If just 40 percent of Abrams’s voters had turned out, the Democrat would have been the next secretary of state. Last month Barrow trailed the Republican by 19,000 votes; last night he trailed him by 60,000, with some absentee ballots still yet to count. Barrow’s lackluster performance may reflect his own shortcomings as a candidate, but more important, in the wake of a top-draw national campaign like Abrams’s, it showed that Democrats are still not putting sufficient resources into recapturing offices like secretary of state, even though that role has enormous influence over voting rules and regulations. With the help of Georgia’s GOP-controlled state legislature, Kemp purged more than a million voters from the rolls for the crime of not voting regularly—something Barrow had promised to reverse—and advised counties on how to close polling places, leading to the loss of more than 200 in the last four years. He used an “exact match” system to guide voter registration, thwarting more than 50,000 Georgians this year alone just because the name on their identification wasn’t an exact match with the name on voter rolls—it might be missing a middle initial, for instance, or the hyphen in a last name. Although Democrats won secretary-of-state races in Arizona, Colorado, and Michigan this year, they lost some promising pickup opportunities in Iowa, Nevada, Kansas, Ohio—and now Georgia. Democrats were slow to match the energy Republicans put into flipping state legislatures over the last 10 years, and even as they make gains, the GOP tries to thwart them. As I write, Wisconsin Republicans are trying to limit the power of new Democratic Governor Tony Evers and Attorney General Josh Kaul, and also reduce voting rights, in a lame-duck session. Georgia voters had a chance to begin to level the playing field for state offices—but Democrats didn’t grab it.